The Rancho Bernardo Hooters is now missing a jukebox after a couple of burglars stole the machine from the lobby of the restaurant. Detectives are searching for two unknown men who stole a jukebox from the lobby of a Hooters restaurant in Rancho Bernardo. 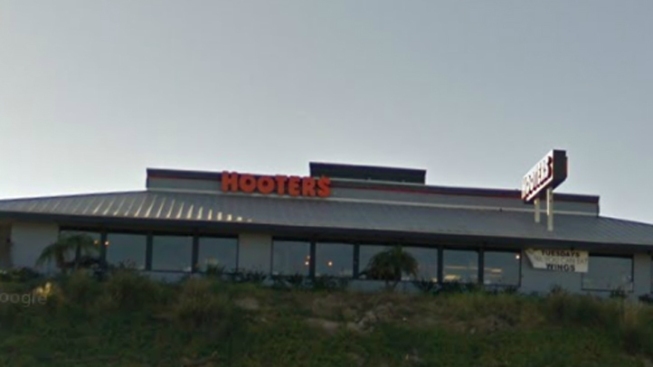 According to police, the bizarre burglary happened on Tuesday just after 4 a.m. at the Hooters located at 16911 W. Bernardo Dr. The restaurant was closed at the time when two men in a white or silver-colored pickup truck drove to the front of the business. The passenger of the truck got out and broke the glass door of the restaurant with an unknown object. Police say the driver remained inside the truck and attempted to back the vehicle into the restaurant, but the door opening wasn’t wide enough. The passenger then took a tow strap from the bed of the truck and wrapped it around a free-standing jukebox that was in the lobby of the Hooters restaurant. The man pushed the jukebox out of the building and the driver then helped lift it into the bed of the truck. Once that was done, the suspects drove away in an unknown direction. Detectives believe the men mistook the jukebox for an ATM. The entire burglary was caught on surveillance tape (video embedded below), and investigators are now using the video to assist in tracking down the suspects. Police say the men are both in their late teens or early 20s. They wore dark, baggy clothing – including hooded sweatshirts with the hoods pulled over their heads – during the robbery. Their pickup truck is a late 1990s model Nissan or Dodge with a crew or extended crab. The truck hit the building when the men tried to back up into the lobby, causing damage to the rear sides of the vehicle and the tail lights. Detectives found pieces of the broken tail lights at the scene. Police say the stolen jukebox is around five feet tall and has the Hooters logo on it. Anyone with information about this case is asked to contact the San Diego Police Department at (858) 538-8000 or Crime Stoppers at (888) 580-8477.